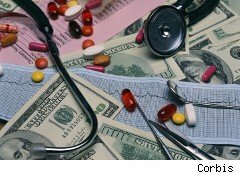 U.S. health care costs will increase between 10.5% and 11% over the next year, marginally higher than the increases that occurred during the past two years, but lower than cost increases earlier in the decade, consulting firm Aon (AON) said in a report released Wednesday. Aon pins next year's increase on such factors as rising prescription drug costs and the health care reform law enacted this past spring. HMO, POS and PPO health plan costs will rise 10.5%, 10.6% and 10.7% respectively over the next 12 months, compared to 10.4% 10.4% and 10.7% a year earlier, Aon said, noting that health care cost increases have actually declined since the 13% to 16% growth rates during the middle part of the decade. The health care reform law, which President Obama signed in March, is expected to add between 2% and 5% to costs over the next three years, Aon said. Prescription drug costs will increase 8.4%, while expenses related to specialty pharmacy products will surge 14%. Businesses looking to cut health insurance costs -- or at least limit expense growth -- should develop company-wide wellness programs that reward employees for staying healthy, according to John Zern, U.S. health and benefits practice director at Aon. Smaller companies will be eligible for grants related to wellness programs starting next year.